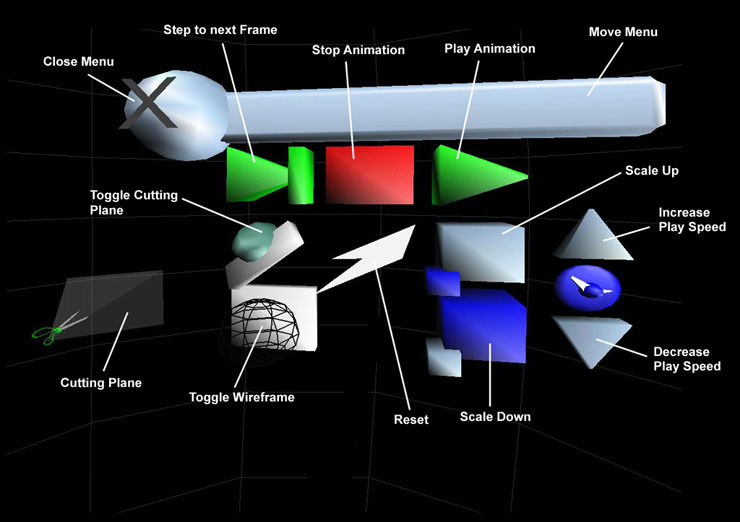 The overall concept behind AGAVE is to append a low-cost PC-based graphics workstation to an Access Grid node that can be used to project 3D stereoscopic computer graphics to allow collaborators to share 3D content. The details on how to build the AGAVE can be found at: www.evl.uic.edu/cavern/agave. This document describes how to install several pieces of software that will allow collaborators to share 3D content over AGAVE. COANIM (or the Collaborative Animator) is the application for viewing 3D content over AGAVE. It basically provides a flip-book playback of 3D models. 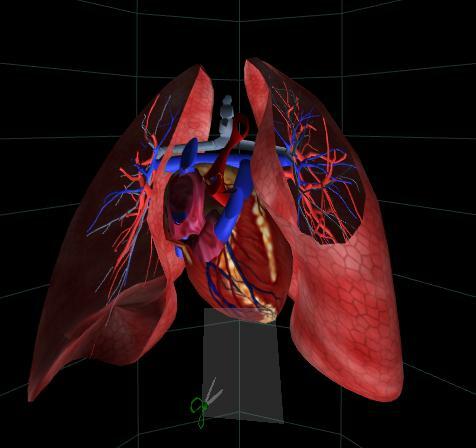 Coanim provides this capability to collaborating users so that several users can playback, stop, and single step through the animation.The example dataset that has been included in this distribution contains an animation of the heart and lung showing the blood flow between them. 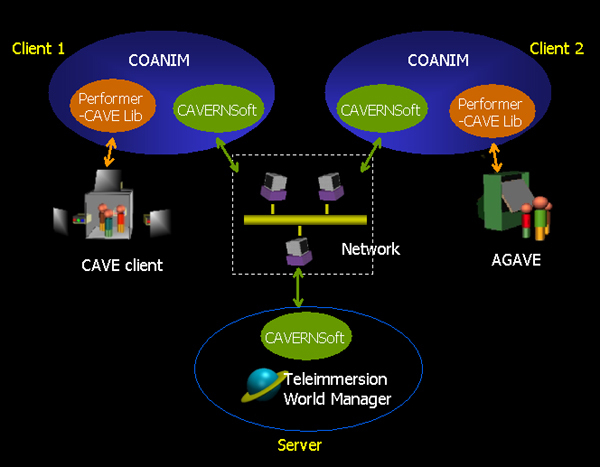 COANIM relies on the CAVERNsoft toolkit for the networking support required in order for distributed users to collaboratively visualize data. The IRIS Performer and CAVElib allows the COANIM application to run across various display architectures. Hence, a collaborator in the CAVE is able to work with a collaborator on AGAVE seamlessly. This will bring up a model of the heart and lung as shown below. If you do not experience the 3D nature of the graphics, you will have to adjust certain parameters in the configuration file .caverc located under AGAVE/modules_xxx/coanim. The file explains which parameters ( X and Y offsets) you would need to modify. Use the RUN_CLIENT script as an example of how to use coanim to view your own data. Note that coanim requires that you have a copy of all the data at each collaborating site before collaboration begins, since coanim must load the data files from local disk. See the section on Importing Your Own Modules for details. Note also that you can obtain a list of coanim's command line options by typing: coanim and pressing return. With this example, among other things, you can cycle through the animation of the lung, and using the cutting plane, slice through the heart to see the blood flow inside. Described here are all the possible forms of interaction. Alternatively, all the menu options above are also accessible using the following keyboard shortcuts. In AGAVE, the wand is controlled using the mouse and keyboard. Moving the mouse while holding down the appropriate key will move or rotate the wand. Pressing the mouse buttons corresponds to pressing the wand buttons. Holding down the spacebar while moving the mouse controls the joystick values. Note that the joystick controls set the X and Y values based on the current position of the mouse on the screen, rather than the mouse's relative movement (i.e. the top of the screen is Y=1.0, etc.). The joystick is reset to (0,0) when the spacebar is released. Set an environment variable CAVERN_DISTRIB to point to the CAVERNsoft distribution within the AGAVE directory.